ZING Digital Kerala from Dish TV is launching on 5th August 2015. You can check the Channels, Packages, Images etc of The ZING Digital Kerala from Here. Swagatham Pack is the Basic package and its Having 150 Channels and Services. Swagatham Pack of Zing Digital pricing at R.S 99 (inclusive of all taxes). In This package there is No Asianet, Surya TV Channels. Amrita, Kairali, Kairali We, Matrubhumi News, Media One, Shalom, GOD, Flowers TV, Mazhavil Manorama, People, Jeevan, Kappa, Kaumudy, Goodness, TV News, DD4 Malayalam are the malayalam channels in this pack. You can check Other Packages of ZING Digital Kerala From Here. Ullasam Pack Of Zing Kerala Offering 215 + Channels & Services for Just R.S 199. Ullasam Pack Of Zing Kerala Having 26 Malayalam Channels. You can enjoy almost all the Major Malayalam Channels Through This Packages. Asianet , Asianet Plus, Surya TV, Safari etc can be watch through this Package. There are lot of other Languages channels, Movie Channels, Sports Channels etc Available On Ullasam Pack Of Zing Digital Kerala. Kaayikam Pack is another Package from Zing Digital Kerala, Its Offering 225 + Channels & Services For R.S 239. Utsawam Package is the Higher Package from Zing Digital Malayalam Offering 290 + Channels & Services for R.S 349. How can i get a connection of This Indian DTH Service Provider ? – You need to purchase the Hardware Like Dish and Set Top Box. 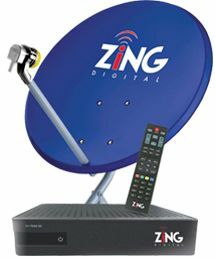 Zing Digital is from Dish TV and Its Offering Maximum Regional Content. You can Use the SMS Codes – ZING and send it to 57575 for any queries with Zing Digital Malayalam. If you want to purchase a new connection of Zing Digital Can use the SMS code ” ZING Dealer ” to find the nearest Dealer. [email protected] is the official Email id and 1860-180-5757 is Toll Free Number. I am staying in Gujarat, can I buy this DISH TV Zing from here. And if so, please inform the nearest dealer address in Vadodara. I want all malayalam channels. I am staying in alappuzha district, mavelikkara village. What is the cost. Along with malayalam what are the other languages you are providing. Annd also inform me the cost also. You can also view Tamil and Malayalam Channels for free to Air (FTA) on Eutelsat 70B satellite at 70.5 degree east freq 11356 V with small 65-90 cm Ku-band dish and any Mpeg4 decoder. Tolfree no at lest 100 times.result is nill zing digitals team making fool the real customers. I like to through out this uselles DTH…..
what value of antenna , no of free channel all time bangali , hindi and others ,please tall me. No suryamusic.jai hind,rajmusic etc,why this much north indian channels for keralites.See sun direct. I want new connection ZING DTH , ullasam package, presntly staying at changanassery,perunna, malayakunnu near to SNDP Temple sivanandapuram .what will be the exact cost of dish & accessories. we are ashamed to see that the recharge end date is seen at the middle of the screen from the 20th day onwards. eventhough we are aware of the same and not making any pending for the recharge. That FUEL GUAGE emblem makes disruption in viewing the TV Screen. Please avoid this type of warnings. May I know if you have any distributors at Palakkad, Mannarkkad. in kolkata service is availabel then plese send.